Description: This is a very tall sea-pen, often found in very large colonies and growing up to 1.5m long. It is curved characteristically in the upper one third. 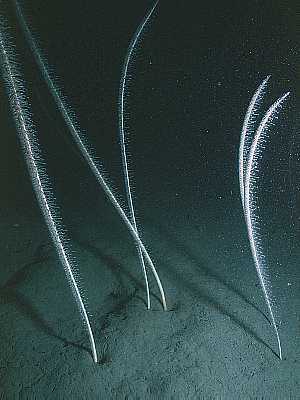 The central stalk is about 10mm thick and the polyps arise directly from the stalk. Its colour is white, the polyps are sometimes pale pink. The calcareous axis is square in section. Habitat: Lives embedded in mud in depths greater than 30m usually with the Norway Lobster, Nephrops norvegicus. Distribution: Found on all western coasts of the British Isles, rather local and normally in deep water. It has only been encountered recently by divers in fjordic sea loughs on the west coast of Scotland. It may have been eliminated from many previous localities by trawling for Nephrops. Recorded throughout the western Atlantic and Mediterranean Sea, possibly world-wide. Similar Species: Virgularia mirabilis is a much smaller sea-pen which is straight and has the polyps on "leaves". Colonies may be very large. Polyps arise directly from the stalk. Central axis is square in section. Picton, B.E. & Morrow, C.C. (2016). Funiculina quadrangularis (Pallas, 1766). [In] Encyclopedia of Marine Life of Britain and Ireland.